Finishing a season 13-0 with an 0.18 ERA is unheard of. That is until you familiarize yourself with Lance McCullers Jr. The right-handed pitcher who hails from Tampa Florida completed his senior year at Jesuit High School with just that stat line. Even before he started his incredible season he was already one of the top ranked pitchers eligible to be drafted in 2012. In this weeks feature we take a look at McCullers Jr. phenomenal high school numbers, his blood lines and of course signing with the Houston Astros. The McCullers name has been in baseball for a number of years. 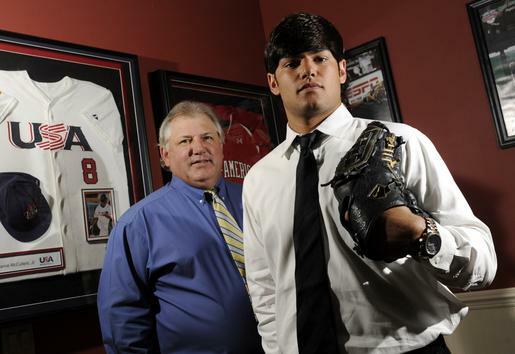 McCullers father Lance was drafted in the 1982 draft in the 2nd round by the Philadelphia Phillies. McCullers Sr. was drafted as a pitcher and spent most of his seven-year big league career in the bullpen. During his career he spent time with four teams (Padres, Yankees, Tigers and Rangers) and had his most productive seasons with the San Diego Padres. With the Padres (1985-88) McCullers posted a 2.96 ERA in 392 innings pitched spanning 229 appearances. In the bullpen McCullers Sr also earned 36 saves with the Padres. As the baton gets set to be passed to the next generation the younger McCullers would like nothing more than to follow in his fathers footsteps with one exception however. McCullers Jr. plans on making it to the majors as a starting pitcher rather than reliever even though some experts feel he is destined for the bullpen. As McCullers Jr. approached his senior year at Jesuit High School there was already a buzz about his future and what might happen in the approaching 2012 player draft. Many draft guru’s and prognosticators from sites such as Baseball America, Baseball Prospectus, and ESPN all predicted that McCullers Jr would ultimately end up as a fireballer at the back-end of a bullpen or a future closer. One of the main reasons for these predictions was leading into his senior year McCullers Jr. was used primarily as a closer at Jesuit High School, one of the top high school baseball programs in the country. The right hander hurler set out to prove those guru’s wrong when he stepped on the hill to start his senior season. With a bit of a chip on his shoulder he dominated his opponents start after start after start. In the end, McCullers Jr. put up a stat line for the ages. Not only did he finish the season 13-0 with a jaw dropping 0.18 ERA but he also struck out 140 batters which equates out to 45% of all batters he faced. Over the course of those 13 starts the righty only allowed 2 earn runs. Off the field McCullers Jr. has racked up an impressive series of awards and recognition. Heading into his senior year he was given The Jackie Robinson Award, given annually to the top rising senior in the country. As he closed the doors on his high school career he was awarded the 2012 Gatorade Baseball Player Of The Year. The Gatorade award is not only given for performance on the field but also in the class room and community. McCullers Jr. not only has excelled on the field but has also done and incredible amount off. According to his Gatorade POY profile: “McCullers volunteers with Challenger Baseball, the Special Olympics, Metropolitan Ministries, the Head Start program and serves as an assistant at the Bakas Equestrian Center for intellectually challenged children. He has also donated his time to a literacy outreach program as a motivational speaker for middle school children and to multiple food drives associated with Jesuit High School” These great achievements are just two of the many awards he has received during the last year. Even with a combination of eye-popping statistics, the impressive accolades and a three pitch mix (which includes a change-up, curveball and a fastball that sits between 93-97 and tops out at 100 mph) McCullers Jr. still had his share of skeptics leading up to the draft. Many talent evaluators did not doubt McCullers Jr. arm but felt that his mechanics still lent themselves better to the bullpen. Besides those views some saw McCullers Jr. strong committment to the University of Florida as one that would not be broken.All these factors led to McCullers Jr. falling to the 41st pick in the supplemental portion of the 1st round when the Houston Astros called his name. With new draft rules in order on teams spending it was unknown if the Astros would be able to step up an allocate the money needed to persuade the fireballer from heading to College. The Astros executed their draft strategy under first year GM Jeff Luhnow perfectly by signing 1st overall pick Carlos Correra to a deal under the league recommended price freeing up money to allocate to McCullers Jr.
On June 19th after just a few short weeks of discussions between Luhnow and advisor Scott Boras, The Astros made it official welcoming McCullers Jr. to the organization. The right-handed pitcher reportedly received a 2.5 million dollar signing bonus from the Astros. The organization treated the talented pitcher to an exciting evening at the ballpark. McCullers Jr. was able to throw a bullpen session at Minute Maid park, meet some players and was introduced to the home crowd to a roaring ovation. Just days after signing he reported to the Astros facilities in Florida where he has been busy throwing bullpens and working on his mechanics. In the coming days McCullers Jr. will most likely make his professional debut with their Gulf Coast League team. With McCullers Jr. journey set to begin he hopes to continue to prove those critics and evaluators wrong who project he cannot be a successful starter at the professional level. Chasing MLB Dreams will follow every step of that journey with updates on the progress of the right hander. Be sure to follow Lance on twitter @LMcCullers_23 and follow us for updates on all our featured players on twitter @CTD_Sypien. Ten Questions with Lance McCullers Jr.
Tell us a short bit about yourself and then also what pitches you throw on the mound and some strengths and weaknesses? I am a Tampa born and raised kid and I love fishing, shooting and all sports. I feature a 93-97 fastball that touches 100 sometimes. Along with that I have a hard curve ball that I throw around 83-86 and an improving change-up that I will relying more on entering pro ball. My fastball has good movement into the right-handed batters. Your numbers are eye-popping this season (13-0 record with a 0.18 ERA and 140 strikeouts against 30 walks in 77.1 innings) What were the keys for you to have such a successful and dominating season? Just always staying focused on the task in front of me and always improving start to start. Never being happy or pleased with my numbers and performance, always striving to be better. I’m sure at times you had a plethora of scouts on hand to watch you pitch, did you ever feel any additional pressure being in the spotlight knowing they were documenting everything you did? When you play on a lot of big stages you begin to understand that playing inside your talents and boundaries are actually when you play your best and impress the most. I play baseball because I love the game and enjoy it, not for scouts or media purposes, that is a perk but not what baseball is all about. 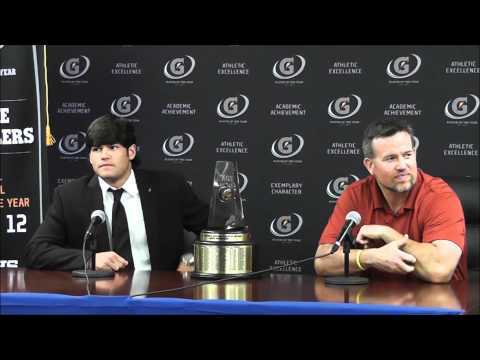 Gatorade Player of the Year – In your own words tell us what this award means to you? Such an extraordinary award to win, blessed to have been considered in that group of athletes. The Gatorade award, along with the Jackie Robinson top rising prospect award, are about more than just the game of baseball. It represents your on field accomplishments with your desire to help others as well. I am honored to have won an award of such high stature and importance. Your father had a big league career, how has your Dad helped / guided you in the game of baseball? My success is due to my father and without him I couldn’t have even imagined accomplishing half of what I have so far. He will continue helping me in the most important part of my career and will alway be my mentor. The Houston Astros selected you on the 1st night of the Draft – tell us about your draft night and what it means to you to be selected. It was a long draft night but I couldn’t have asked for a better organization or situation to now be apart of. The Astros are committed to becoming an elite team again and I am excited to hopefully be apart of that as well. You just signed with the Houston Astros and are set to begin your pro career, overall what was the negotiation process like? Like I said, the Astros are dedicated to bringing winning ways back to Houston. They were very willing to work with me and my family and got a deal done quickly and smoothly. You spent a couple of days in Houston. Is there anything exciting that you got to do or people you got to meet? Being able to sign, dress in the locker room, be introduced on the field and throw a bullpen were all amazing. The players and upper management went above and beyond on the accommodations for my family and making us feel welcome. We had an amazing time in Houston. Now that your signed whats up next for you? Going out wherever I am sent and throwing my heart out like I always do for the name across my chest. You have had the opportunity to play for Team USA. What was your most memorable moment/experience playing with Team USA? Developing great friendships, such as Bubba Starling and Almora. I had a great time traveling the US and playing for my Country. Favorite Team and Player Growing up? Astros of course! My father and Mo Rivera. I’m a baseball player! Too many to name but I always eat the same sandwich before my starts. A big thanks to Lance for taking time out to sit down and answer some questions shortly after he signed his contract with the Astros. We look forward to following him during the 2012 season and into the future. Remember to follow Lance on twitter @LMcCullers_23 .